Gabby looked at her grandmother “Be what?” she asked. Gram took another sip of tea, “At first you might need to lie down, or close your eyes, or be in a quiet space. Then just be. Kids need to learn to be at peace with themselves, to think by themselves, to love themselves. We all need to let go, breathe deeply and be one with quiet. As I sit here in the moment, I feel a breeze on my face, the rustle of leaves, a distant boat and many birds. I am grateful for all of it, but I had to learn to be. In an article in the Huffington Post, this is also called mindfulness training. In a world of TV, video games, email, Instagram and phones that do it all, sitting alone has changed. More and people are not participating in the events they go to, much less spend quiet time with their thoughts. It is an easy change, but takes some effort. 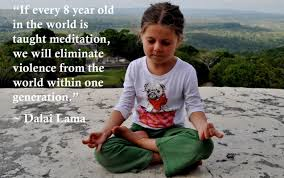 So why should kids (and you) learn to be at peace with yourself? My first thought is to find out who you are. Sure you know what you think you think but is that really you? Do you sound like your mother? Grandmother? Best friend? Discovering that many of “my” beliefs weren’t mine at all, was a huge surprise. Here I am defending what I believe to be true and I never considered whether I really believe that. Think that is ludicrous? Try it! Analyze your strong beliefs. What do you defend to the nth degree? Any chance someone else’s points might be valid? You will never know if you don’t take time to think about it in the quiet and from your heart. Many of your beliefs were set while you were a young child. Many of those beliefs you have already passed on to your children and they aren’t even yours! Prayer and meditation are valuable in connecting with God, your creator. Connection beyond one’s self helps children as well as adults stay centered and grounded and with that comes power- not over someone or something else, but from within, a feeling that all things are possible. One of the first affirmations I learned was from Tony Robbins, “All I need is within me now.” That is powerful! During peace and quiet times, gratitude can flourish if children are taught to make it a part of their daily thoughts. It is a frame of mind that once learned reduces negativity, fear, judgment and criticism. Positivity becomes the primary thought process. With gratitude comes joy. With joy, their ‘all about me’ self, your ego diminishes bringing you and them closer to peace. Children can also be taught to set intentions, like a to-do list for a way of being. Rather than, ‘I will make my bed’, it might be, ‘I will be kind and helpful to my sister.’ Just being alone in quiet is a perfect time for this! They can call it their ‘to be” list! Quiet time, just being time allows children to learn to appreciate themselves as well. Quiet alone time can be used for ‘What I love about me’. Gram told the children in the story “Just Being” that by loving themselves as God loves them, they are showing appreciation for the gifts He gave them. She also recommended that they thank Him for things they don’t quite believe are true yet because the more they think it and say it, the sooner they will believe in themselves. Contentment comes with just being which leaves boredom out of their vocabulary. Now that is truly a gift! ← Bullied, Bully, An Observer of Bullying. Which is Your Child?